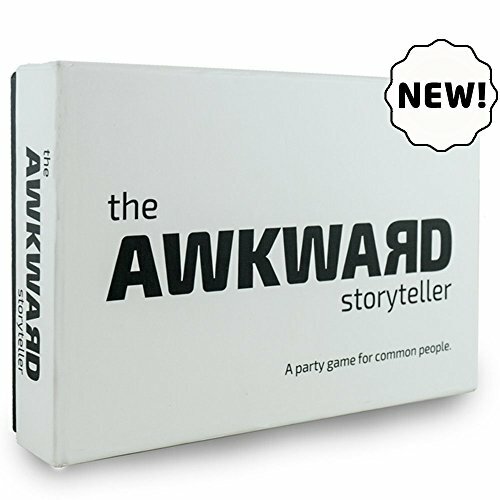 The Awkward Storyteller is a straightforward party game for 4 to 11 players aged 16 and up. The format is certain to get participants smiling, interacting and thinking up original twists and plot lines for their story, which they make up as they go along, for the entertainment of the other players and anyone else who is listening. If the Storyteller does not answer within 10 seconds their turn ends. If you think that their answer doesn't make sense, you can play a red card and all players will validate or discard the awnser with their green or red card. Contains 121 questions cards, 50 story cards, 11 challenge cards and 1 hourglass timer. Superb replayability. Party game for families, teens and adults. Perfect for a family get-together like Thanksgiving, Christmas, holidays, camping, night party or simply have some quality and fun time with friends. Premium quality. Perfect gift!